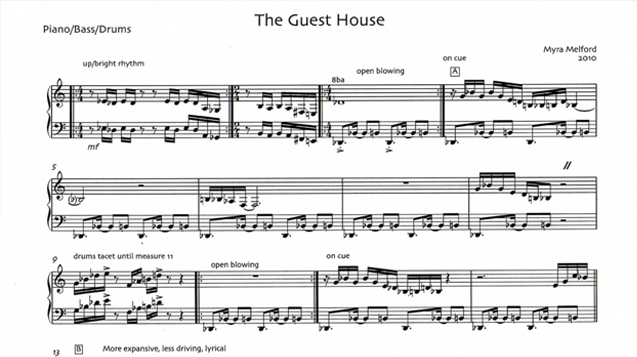 Your most recent album is "The Guest House," made with Trio M, with bassist Mark Dresser and drummer Matt Wilson. Could you speak to how an ideal of collectivism informs this group's music? As a process, is it distinct from the way it played out in Equal Interest, another excellent trio, which was aptly named? From the very beginning of Trio M, there was an implicit understanding between us that this was not the traditional piano trio, where piano basically takes the lead and the bass and drums provide support and accompaniment. 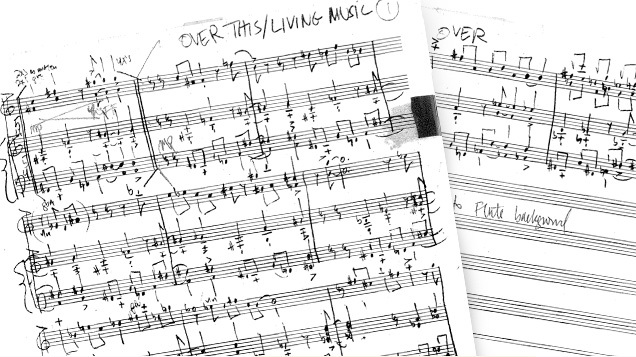 Drawing from our experience in both contemporary jazz and improvisational or experimental musics, the notion of hierarchy was never part of our approach. This operated on the level of repertoire, we all write for the band, and a typical concert or recording will feature an equal number of pieces by each of us. It also operates on the level of leadership in terms of representing the band—though we’ve fallen into some rolls about handling business issues or who speaks to the audience, those are still fluid, we’re all responsible for every aspect of the band’s working life. But it’s on the bandstand while playing music that this collectivism really shines—we’ve developed a level of trust where anyone can suggest the music go in any direction at any time, and the rest of us will be right there. Any of us can lead or accompany to the point where we sometimes abandon the idea of ‘solos’ altogether, though anything is fair game. That’s what makes this band so exciting and fulfilling for me. Equal Interest operated on a very similar principle, hence the name of the band; all three of us composed, and no single person was the leader artistically or business-wise. There was a similar sense of freedom in the music, in that anyone could influence the music’s direction as it unfolded. And yet, it was a very different experience for me to play in this band. The music had a unique personality in that it was created by a different set of musical lexicons and voices. The instrumentation—violin/viola, saxophones/flute, and piano/harmonium, created not only a singular and multifarious palette of colors, but suggested a kind of chamber music as compared to a traditional jazz ensemble, which gave me the opportunity to find new ways of accompanying as well as being a lead instrument. And, Leroy and Joseph played with great mastery, both technically on their instruments and in terms of expressivity—they had each honed a very distinctive voice as an improviser and composer, which constantly inspired me to reach for that level within myself. It was a very challenging and joyous experience. You also have a longtime collaborative history with the multi-reedist Marty Ehrlich. What's special for you about your rapport? Marty and I share a similar background in combining approaches from jazz as well as more experimental practices, and we both love a beautiful melody and a great groove, as much as we enjoy playing off of each other’s energy and textural vocabulary. It makes the duo a platform for a rich and varied musical conversation, which is, in no small part, aided by a kind of magical chemistry. You've also collaborated widely with artists like the Butoh dancer-choreographer Oguri (in your new ensemble Snowy Egret). Does a creative interaction with a non-musician feel the same, in some ways, as one with another member of the ensemble? It’s both similar and different. Oguri is an amazing collaborator and artist who very naturally engages with improvisational music. The reason I wanted to have him in my new ensemble is precisely because he doesn’t feel like a ‘non-musician,’ even though he expresses himself through movement rather than music/sound. On the other hand, he brings a new sensibility and dimension to the interaction amongst the musicians, as well as between musician and dancer. You asked me earlier about my multi-disciplinary approach and the inspiration I get from other art forms. Working with Oguri is an opportunity to engage in that conversation between myself and another work of art or artist in a real-time performance. I'm currently working on plans to have Snowy Egret present a mixed-media project based on the writing of Eduardo Galeano, the Uruguayan novelist, fabulist, and journalist. The project which doesn’t have a new title, yet, began as “Happy Whistlings” for a quartet of improvising musicians, but has evolved into a larger ensemble of musicians and dancer, and will be further enhanced by a filmic backdrop, an abstracted, moving painting of light and image, based on Genesis from the “Memory of Fire Trilogy.” For this project, I envision Oguri expressing the human experience/dimension of Galeano’s work in way that augments the musical material and interaction amongst the musicians. In Trio M hierarchy was never part of our approach. Anyone can suggest the music go in any direction at any time, and the rest of us will be right there. Myra Melford, piano, inside piano, and electronics; Dawn Saito, choreography; Oguri, dance. Presented at the Walker Art Center, 2006.